First, a clarification: Young Muslims on Twitter (part 1) was neither intended to generalise any group of people, nor was my intention to “bash hijabis”. While the feedback was 95% positive, the difference in the way people interpreted it, i.e. some saying I generalised and others saying I didn’t, shows the difference in the way people read things. I deeply revere the hijab and deeply respect those who wear it. 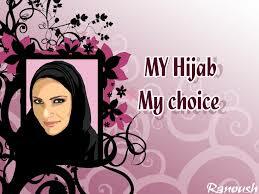 I understand from the Islamic tradition that the hijab is seen as a symbol of reverence for the holiness of women. I also understand the tremendous difficulties hijabis go through, it’s not easy. I would never want to add to your difficulties. So forgive me if I did offend any of you. What I’m aiming to do is show some of the stuff that happens on Twitter, so that we can reflect and hopefully learn. This is by no means an attempt to guess what people’s intentions are or to paint all young Muslims with the same brush, but simply some thoughts on what I commonly observe. Many young Muslims tweet really nice Islamic messages, sometimes Hadith, often quotes by Rumi. But far too often they’ll also tweet stuff that, let’s just say, they would prefer their fathers not to see. The litmus test before tweeting should be: If your father was standing there, would you still tweet this? The contrasting and contradictory tweets are symptomatic of the society in which young Muslims find themselves in. On the one hand, they want to be good Muslims, but on the other, there are strong forces pulling them away from their religion. In part 1, I mentioned that pretty hijabi girls have a lot of followers, especially the ones who tweet a lot about Islam. There are also a lot of decent looking Muslim guys who have a lot of followers. But among the most popular, are Muslim guys who combine tweets about Islam with plenty of silly and jokey tweets. The guy below tweets about Islam and is also funny. Anyway back to hijabis. Have you noticed that many pretty hijabis, especially the ones with a lot of followers, will favourite everything you tweet them? Even if you say “lol” they will favourite it. One great thing about Twitter is that it is likely that many, many people would have started praying Fajr, the morning prayer, because of it. Many young Muslims will wake up for Fajr and will tweet something like: “Awaken for Fajr, soldiers of Allah”, or “I love the sound of birds chirping once I pray Fajr”. This is all great encouragement for those who don’t pray Fajr. This is probably not exclusive to the young Muslim community but there are so many people who follow loads of people, get loads of followers in return, and then unfollow 95% of their followers so that it looks like they are popular. 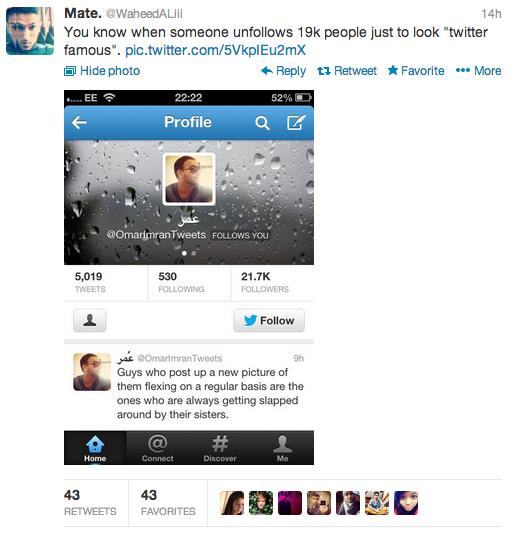 How can you have 50 followers one minute, and then 5,000 followers the next minute? Don’t try it. We all see what you’re up to. People who decide to unfollow almost all of their followers are basically showing that they tweet because they want others to know what they are up to, and don’t care what others are up to. There are also many hijabi girls, many of whom do Youtube tutorials of how to do make up or how to wrap your hijab, who retweet almost every other girl who says they are beautiful. Why? Why are you doing this? Maybe it’s innocent, you just want to show your appreciation of the nice messages. But beware: things like that massage your ego. And, Islamically, your ego is suppose to be humbled so that, ultimately, it no longer controls you. Be careful of retweeting praise of yourself. One of the reasons so many young Muslims are active on Twitter spreading Islam, one could argue, is because they’ve become disaffected by the traditional means of learning about their faith. Far too many Imams, especially in the UK, can’t speak English… and if they do, speak broken English… and, even if they do, don’t seem highly educated. This is really off-putting. It’s no wonder what all these young Muslims are doing on Twitter. Good article! Its a shame about your reference to that @waheed guy, his tweets are humours yet has plenty of vile and disgusting tweets at the same time. Probably not a good example when talking about Islam, brother. le problème pour moi c’est pas parce que vous etes qadiani , vous etes libre de croire de ce que vous voulez ,mais le problème pour moi sont les qadianis qui se cachent leur identities derière l’islam c’est henteux , quoi chère monsieur anonymous les qadieniens sont pas fière de leur religion et de leur prophet “ghulam ” c’est pour ca ils ce cachent derière l’islam ? ou pour faire “fitna” entre les musulmants ? You’re English is quite bad. What did you say? I’m a Qadiani?